Yesterday, as I sat in a Tim Horton's on Pembina Highway between seven and eleven in the morning, I could not help but overhear many of the ongoing conversations between other patrons sitting beside me. Almost every conversation that morning in that Tim Hortons started with talking about the Jets-Senators game the day before. As I wore my white Jets hat and tapped in my article about the Jets Mark Scheifele conundrum, I barely held myself from joining in on a conversation with strangers - all of them strangers. But not just strangers - Winnipeggers. They're happy to have their team back - and most importantly the love their team. Every night at the MTS Centre there will be 15,015 coaches and GM's debating what to do with the team - who to send down, who to put together on a line, who will play better together on defense, and who's the next star. But it's more than the 15,015 that sit in MTS Centre cushioned seats who will make up the fabric of this hockey mad city and province. 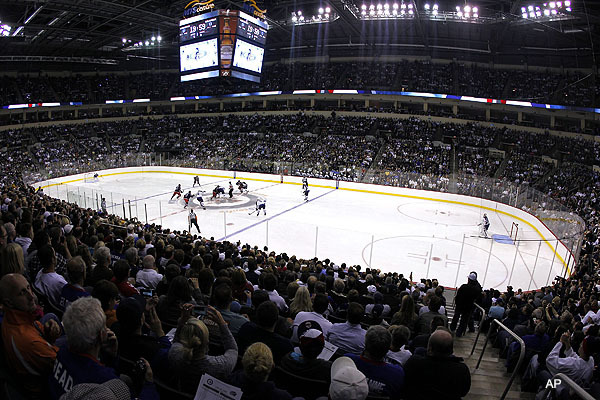 The nearest NHL team to our Jets are the Minnesota Wild in St. Paul - 750 kilometers away. The nearest Canadian NHL team are the Calgary Flames who are 1327 kilometers away. 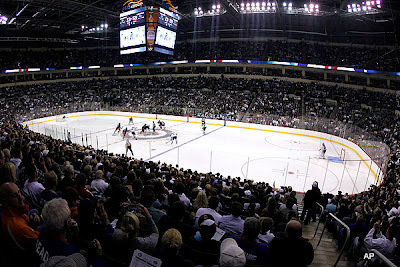 The Jets own their territory and those fans become more than just a little bit invested in their team. So what if you don't have tickets to the games? You're still a fan. It always brings a grin to my face whenever I overhear a conversation in Winnipeg about the Jets, about last night's game, about Mark Scheifele or Dustin Byfuglien. To hear how excited people get - even 50+ people in Winnipeg! It's as if the city's soul has been put back in place and the healing began 15 years ago when the Manitoba Moose - though not anywhere near NHL calibre - were introduced to us. But, in the end, it's always been about the Jets. And it will always be about the Jets. To show that the city still loved their Jets. I'm guilty as one of them. I wore my Shane Doan Winnipeg Jets jersey to every single exhibition game that was held in the MTS Centre (minus last fall's) and I was proud to wear it. And so were the others who were remembering why this city loves hockey.